Just as there are thousands of ways to homeschool, so there are a multitude of roles fathers can play in happy homeschooling households. Dad’s role will vary depending on many factors, including how often he works away from the home, the ages of the children, and of course the personalities and interests of all concerned. For this week’s Homeschool Help series, here’s a behind-the-scenes peek at C(9) and J(8)’s dad’s role in our homeschool. For most of the time we’ve been homeschooling, James has worked at least twelve hours a day outside the house, Monday to Friday. He leaves the house at 7am and returns at 7pm or later. This means that almost all day-to-day childcare and homeschooling falls to me. But that’s not to say that my husband doesn’t play a very important role in our homeschooling family. Perhaps the most important role my husband plays as far as I’m concerned is that of sounding-board. No-one else knows our children like he does, so whenever I’m considering any changes in the way we homeschool, I talk them through with him. James wasn’t sure about homeschooling in the early days (he hadn’t read the seven zillion books and websites that I had), but to my eternal appreciation he’s always kept an open mind, and he’s now fully on board. I relish sharing with him our children’s successes – usually in the children’s presence – and I discuss with him privately any challenges we’re facing. The kids appreciate their dad’s moral support too. Like most homeschooling families, C(9), J(8) and I spend so much time together we mostly get on great. Even so, having another person around can provide a welcome change of mood! James is a technical whizz who, bless him, happily spends hours posing Lego minifigs and creating green screen special effects making movies with the kids. 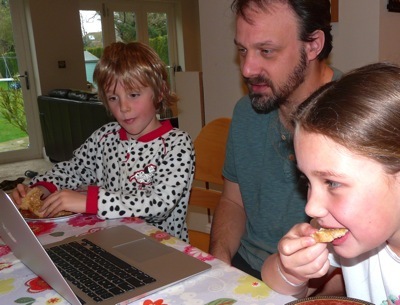 I’m sure he enjoys using his technical skills to make movies more than he enjoys his role as family IT support guy – but I don’t know what we’d do without that aspect of his expertise in our teck-heavy homeschool! If a dad is going to take on any homeschool teaching or mentoring on top of paid full-time work, it helps if he’s passionate about the subject. I know one homeschooing dad who loves taking his son to museums and history clubs at weekends. Another friend, who plays in a band part-time, shares with his daughter his passion for electric guitar. As the non-homeschooling parent, James has more time to make a contribution to the world outside our home. Much of what he does in his role as a banking IT manager goes right over the kids’ heads (and mine! ), but he makes a point of sharing with C(9) and J(8) those parts of what he does that they can understand. Earlier this year, for example, James wrote an Android smartphone app in his spare time. The kids and I excitedly followed along as his app was listed on the Google Play store, then got noticed by a few of the technology news websites, and ended up with over 18,000 active installs. As a consequence of his app’s success, this summer James was invited to attend a three-day, all-expenses paid, developers’ retreat in Paolo Alto, California. We all thought that very cool indeed, and it was fantastic for C(9) and J(8) to see where hobbies can lead! Of course, when only one parent is doing paid work, their income pays for every book, activity, car journey and computer in a homeschool – not to mention the very roof over the family’s heads! I love that on Sundays, he not only takes C(9) to her rugby practice but even walks the dogs at the same time, then comes home and cooks a roast – my hero! Left to our own devices, we’re a family of geeky couch potatoes, so making the time to exercise and get some fresh air is important. 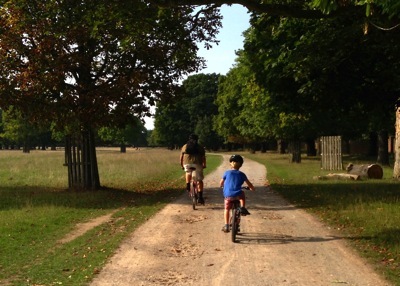 When our kids were babies, James made a conscious commitment that he was going to get active alongside them as they grew up. My lovely husband even agreed – much against his own personal wishes – to get a dog (now two dogs), which gives us a reason to go walking together, whatever the weather. 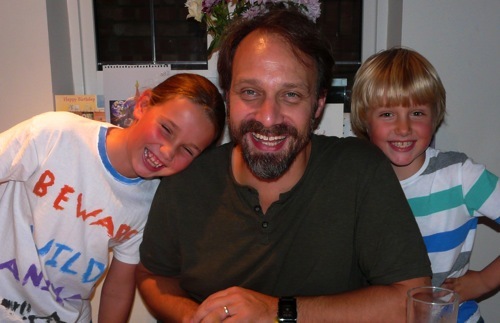 When the kids are asked to describe their dad, one of the first words they use is “fun” – which tells me how much of a success he’s made of the commitment he made ten years ago. I hope I’ve managed to strike a balance here between sharing the contribution my husband makes to our homeschool and not embarrassing him. But I can’t sign off without recognising the fine job my single mum friends do of homeschooling. 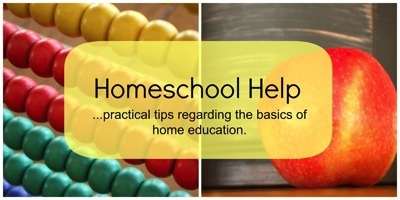 I began this post by acknowledging how many ways there are to successfully home-educate. That includes homeschooling with no dad around. For many reasons, some women find themselves homeschooling without a partner by their side. And some of the most amazing kids I know have at least equally amazing single mums. I myself was brought up by a single mum who did a stupendous job of meeting the needs of my brother, sister and me. Thanks to her example, I’m not the slightest bit fazed by the amount of time I spend alone with my kids. But I do know that C(9) and J(8)’s dad makes a huge contribution to our family and our homeschool, and for that I am truly thankful. How does your partner contribute to your homeschool? I just read you post & I see what you mean! I enjoyed your post! Yes, husbands are good sounding boards. Like your husband, mine shares his skills with our children too. When the kids are asked to describe their dad, one of the first words they use is “fun”… That sounds like something my children would say about their dad. I can see lots of similarities between your family and ours!